I have a thing for old sinks. It doesn’t matter if they’re porcelain or metal or cast iron, I want them in my garden. John and I have been busy planting planters of all kinds… including these three sink planters. 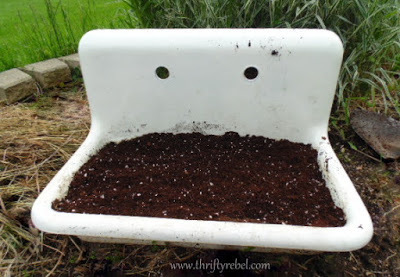 Sinks can be a little tricky to plant in because they only have the one drainage hole. If not careful it can get clogged up with soil, becoming flooded and causing your plant roots to rot. There are a few things that can be done to help prevent that from happening. Here’s the old porcelain farmhouse sink that I found at a garage sale last summer for $10. It’s quite large. I left it in the garden over winter and it came through it beautifully. It probably helped that it was covered in snow. A few weeds were already starting to grow in it. 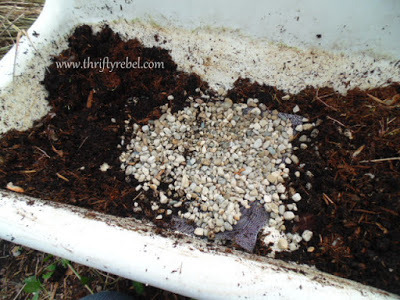 I replace the potting soil in my planters every year. 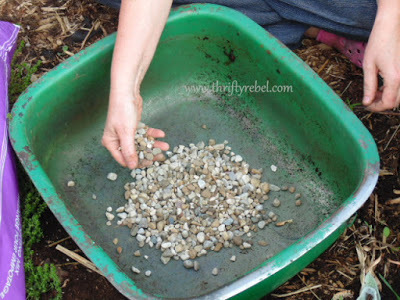 The old stuff gets reused as filler in the garden, as mulch around garden plants, or it gets put in the compost. I put some wire mesh screen in the bottom of the sink to cover the drainage hole. This keeps it open for water to flow through it freely. If it wasn’t there it would become clogged up with soil, and pretty soon there would be no drainage at all. Then I put some gravel on top of the screen. I filled my sink with good quality potting soil. For me it has to have slow release fertilizer in it and moisture retaining particles . In some of my bigger planters it’s much more cost effective, and quicker and easier, to buy a mixed hanging planter and use that rather than individual bedding plants. At our local nursery we can get 2 lovely hanging planters for $25. Sometimes plants are a little, or a lot, root bound. These roots have taken on the shape of the bottom of the planter. 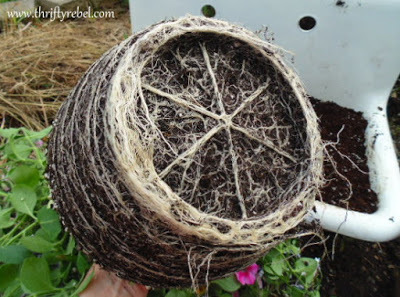 Even once it’s in the new soil the roots will continue to go round and round rather than out and down. 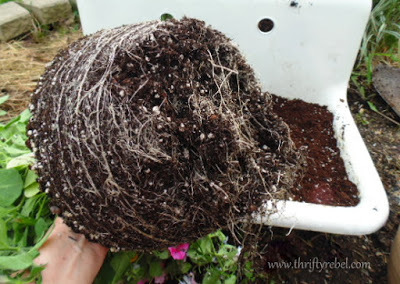 The roots need to be gently broken up, or scarified, so they know that they are free to roam in their new planter home. 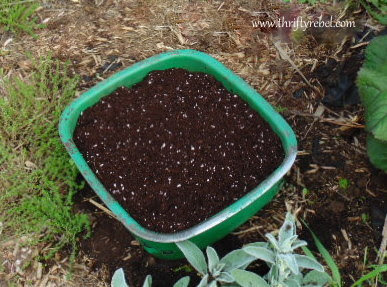 This goes for all root bound plants, whether they’re annuals or perennials… large or small. I have to say that I’m not really too gentle about this, and my plants always do very well. I tend to completely remove the excess roots. In goes the plant, and I have instant beauty in the sink. This will fill in nicely and the flowers will pour over the edges. Here’s my vintage metal sink that I brought home a couple of years ago from my mom’s cottage. This is the supposedly annual ornamental grass that we planted in the centre of the flowers last year. As you can see it came back, and it has grown quite a bit wider since last year. We removed the grass and planted it in the garden. I added some gravel to the bottom of this sink to fill up the drainage hole. I don’t have a photo of this but I also dug down in the garden under the drainage hole and added some pea gravel there as well. Again to keep the drainage hole from clogging, just like the first sink. 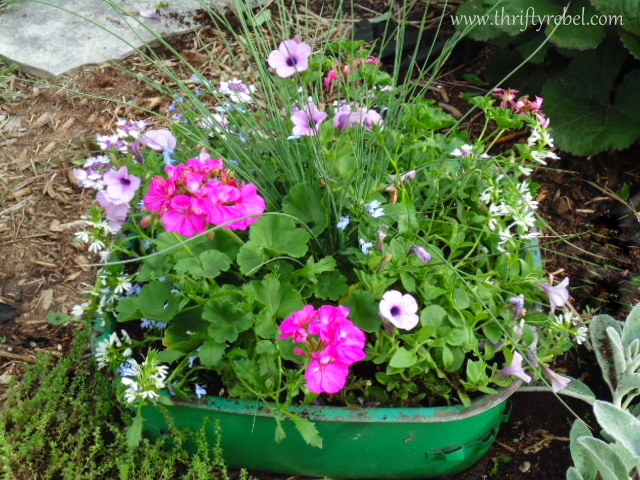 and another mixed hanging planter filled this one up nicely. My third and final sink is this small green porcelain beauty. It wasn’t so beautiful with the remnants of last year’s dead plants still in it. I got this one for $1 last summer. 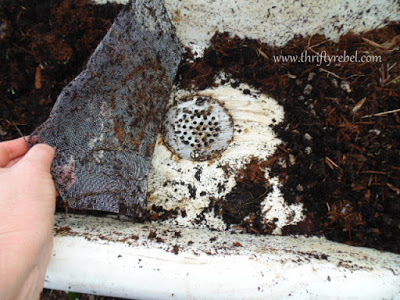 I filled it with potting soil after preparing the sink like the other two. 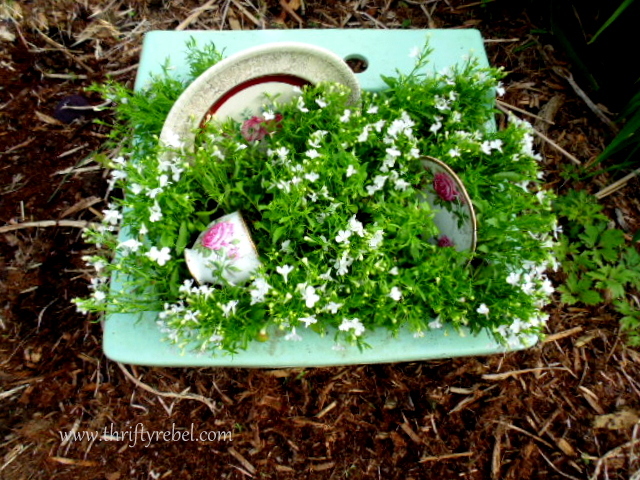 I added a dinner plate and a cup and saucer to the soil, and then I planted around it with white lobelia. I saw this idea on pinterest here. The dishes I used had minor chips in them so they were perfect for this project. I think the sink will look great when the lobelia is in full bloom, and there’s more white than green so it looks like the dishes are in soap suds. I still need to find an old funky looking faucet. So the next time you see a lovely old sink for a good price don’t pass it by. 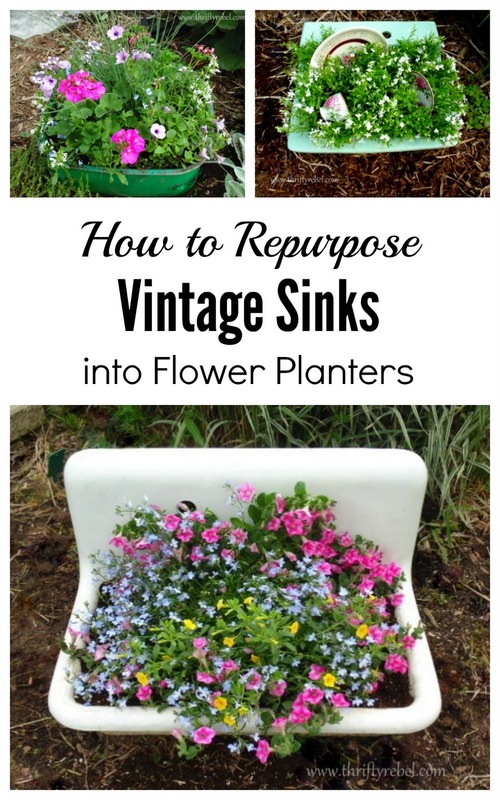 They make beautiful sink planters, adding another element of fun and interest to the garden… and repurposing them keeps these beauties out of the landfill. That’s a big plus in my books. Also, having annuals in the gardens is a nice way to add summer-long colour while the blooms of different perennials come and go. LOVE!!! I'm actually looking for a sink like to top one to use in my house, but it looks great filled with flowers! I have an old sink here that was given to me but think I will use it as a bird bath. I have a plug that covers the drain hole. 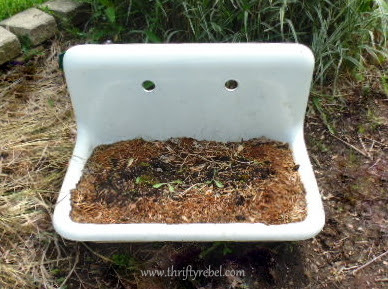 All I need is to have hubby connect a PVC pipe to bottom of drainage hole so it can drain down in the ground when I pull the plug and then able to add fresh water for my fine feathered friends once again. I should had said salvage yard. A person says junk yard, they think of out cars and such. Funny but I never see old sinks while I'm thrifting…..or maybe they are not on my mind to look for and that's why I don't see them! Yours look great and I love the idea of using a hanging plant to fill them up. Love the fridge in the garden! That's fabulous!! I've been looking for a vintage bathtub and toilet for quite some time. Maybe one day I'll find them and have my garden bathroom. lol. In the country we can get away with things like that. Nobody sees the backyard. These are amazing and so unique. Great tips too. Have a wonderful week. You have the best planters! They're so pretty!!! Thanks for the drainage tips. I just put holes in a half barrel and the soil closed the holes up. I should have known to put screen over the holes. Wow I love this idea for a planter and they look so pretty. I would love it if you shared it at our new Cooking and Crafting with J & J link up party! Thanks for sharing this. Very cool! I love old sinks too, and this heat and next will be devoted to sprucing up our disaster of a yard. I may have to put this idea into use someday. Oops, that should be this 'year' not 'heat'. Auto correct sometimes gets weird. Thanks so much Tuula for sharing this tutorial for making a sink planting at our Cooking and Crafting at J & J party. Have a wonderful week! The sink planters look fantastic. Thanks for the tutorial. Good advice! There's an architectural antique store I love, and I might see if they have a small affordable sink and try this myself! Super post. So pretty and so you, Tuula! Thanks for sharing with Roses of Inspiration. Hugs to you! Love your sink planters. Actually, I love anything to do with old sinks. Wish I could find one as cheap as you did! What a great idea. And they already have a draining system in place. Ha! What a CUTE idea! I love this idea! I've seen them before with their pedestals, but I never thought of just using the sink part. Love the green one too. Thanks for sharing at Vintage Inspiration Party. I love then things can get repurposed. Lovely idea! Si have never thought about planting in my sink potting bench but I love the look! Thanks for sharing! My goodness. I just saw an old sink at a yard sale today, and thought… aww, what could I use it for, lol! 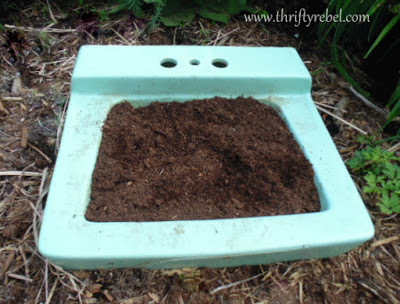 How wonderful to see your post, and I love your idea of the screen over the sink hole to allow for drainage. Your way with vintage sinks is lovely, and I thank you for your inspiration!!! I'd not thought about a sink for a planter, but now after seeing your beauties, I'll be on the lookout! Just lovely, and thanks for the advice on the root bound plants. I think I have quite a few! I will have to make do with enjoying your beautiful planters – the intense heat wave in place here has killed all but the most hardy plants. Love the old fashion sink, but the last one is my favorite. I have a urinal I plant! What a cool idea and the end product is so pretty! By the way, I'd love to invite you post on my new blog hop—the Weekend Blog Hop at My Flagstaff Home (www.myflagstaffhome.com). It begins on Thursday evenings and lasts all weekend, if you're interested. Love them all Tuula! I have one very old and very heavy one planted in my garden and I love it! Thanks for sharing with SYC. Yet another fabulous garden project from you Tuula. These are so unique and so much fun!! I love unique planters in the garden! These are super cute. Featured you at Be Inspired this morning. Thanks so much for sharing! Hi Tuula, just hopping back to let you know that you will be featured at SYC this week. I remember when you bought that porcelain one last year ! 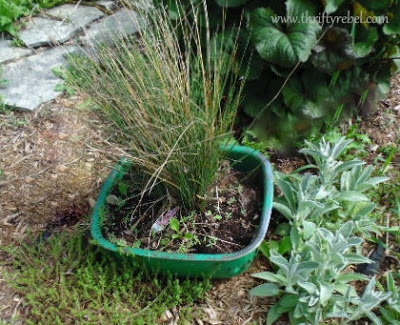 I have everything in the garden EXCEPT the kitchen sink LOL – but I'm on the look out for one! I love the idea of planting the sinks! Something I never thought of! The dishes in with the lobelia is perfect! 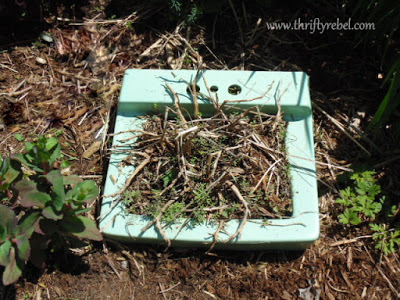 Do you just place the sinks randomly around your yard? Thanks Florence! 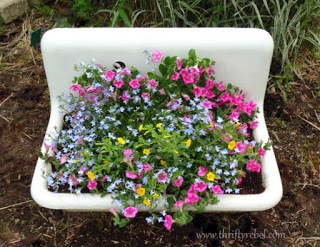 The sinks are placed in different gardens. They’re planted with annuals and add colour among the perennials all summer long.